At what point did you decide to document your adventures and write a book? It was early in 1996 when I began to consider the idea. I had been living in the States for a few months and realized that I had relocated to a country that really wasn’t that interested in soccer. In order to stay connected, to remain “United” with the beautiful game, I had to come up with creative ways to keep up with the all-important results and match reports from back “home.” I began to chronicle these experiences along with the contrasts of living in a new country. I met unique characters, soccer fans from all walks of life, an eclectic bunch from various countries with a real passion for the game. I reflected on just how committed to the cause they all were. Before long I became part of an underground soccer subculture gathering to watch live matches from across the Pond. I had further impetus to put pen to paper. Three years later, on May 26 1999, I was stood in a packed-out Irish bar in Michigan cheering Manchester United on in the European Champions League final. That moment proved to be the catalyst for the book that I knew I had to write. It had been such an incredible journey. Being a stranger in a strange land can make for interesting and fun reading. I hope “Life, Liberty, and the Pursuit of United” will testify to that. How quickly did it all come together? Once I had chronicled the characters, it was important to provide a strong narrative and threads throughout the book. The soccer narrative took care of itself really and I began to sense a back story culminating in United’s Treble season success. My original draft was completed sometime around 2001. I then spent hours in bookstores checking out similar genre books for publishing house contact addresses. Late one night I loaded up the seats of my old car with over eighty packaged manuscripts, complete with cover letter and drove to the twenty-four-hour post office at Detroit Metro Airport. One large postage bill later, I headed back to my apartment around one a.m. I was full of dreams. I eventually received thirty plus replies, some encouraging but all rejections. After a little soul searching, I decided to step away from the project for a while. I stored my original drafts and notes on an old hard drive. About four years ago, something sparked me to revisit it. I yanked the hard drive from my old, defunct laptop and found a tech savvy computer buff able to upload my original drafts onto my new device. There were issues with formatting, fonts, paragraph and style settings, but with patience I got there. As I began revising the original manuscript, a friend of mine got in touch. I had known Jon Wilson for many years. He was setting up his own publishing company, Fish Out of Water Books. We talked and it became obvious that we had to make it happen. Jon and I collaborated really well throughout the whole process. I concentrated more on character development, adding dialogue, and researching events, timelines and locations. Jon’s perspective, advice and skill as an editor proved invaluable. 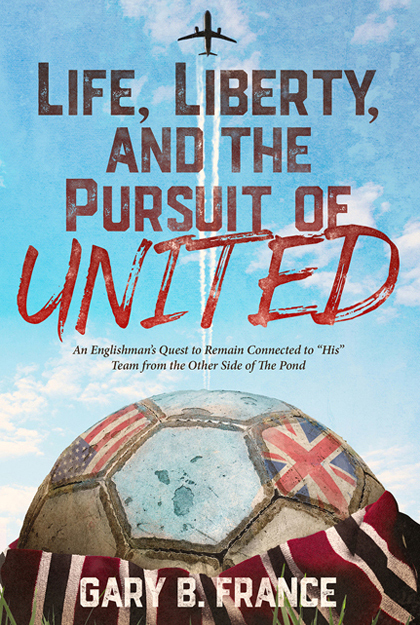 All in all, “Life, Liberty, and the Pursuit of United” has been on the burner for two decades! What were your favorite chapters to write? The early chapters recounting my years growing up in Lancashire when I first became obsessed with football and Manchester United were great fun to write. I wanted to take the reader back, maybe to their own moments when a soccer ball, a few mates and four jackets was all that was required for hours of enjoyment. My initial transition from Great Britain over to living in Michigan was also fun to write, comparing cultures and new surroundings. The characters and past experiences all became real again as I trundled down an American memory lane. It goes without saying that the chapters leading up to Manchester United’s Treble success were terrific to recount too. I really enjoyed writing about the first time I walked into Connor O’Neill’s pub and observing an Irish den in the making. That Saturday, prior to the pub’s opening date, I had grabbed a pen and paper feeling the significance of the moment. Quietly walking through the building I documented the various sights and artifacts that were to decorate the pubs interior. I had finally found my soccer salvation abroad. What do you want readers to take away from reading “Life, Liberty, and the Pursuit of United”? The sense of an honest and enthusiastic journey of one person taking a chance and challenging himself to move forward in life yet at the same time remaining very much attached to the things that matter the most—the roots of family, friends, and, of course, his soccer team! A chance for the reader to appreciate a fan’s passion for his team and for the game of soccer itself borne out of a certain time and place in a young man’s life, giving the reader an opportunity to connect with the writer and the realization that if you allow yourself to be open wonderful experiences and friendships can evolve. What’s so important about soccer in the UK? The tight geography of the UK lends itself to intense competitiveness between its regions. Over centuries, bitter rivalries have evolved. Pride of place and an ingrained sense of belonging ties people together for the cause. What better way to affirm such roots than at a soccer match. The community using its voice, resplendent in the colors of “our team” and “our town,” colors uniting, identifying and aligning with “our own.” Soccer allegiances continue to be passed down from generation to generation. Dad a City supporter; mum a United fan; brother versus brother, one wearing a Liverpool scarf, the other an Everton shirt. The Christmas period, to me, further epitomizes soccer’s relevance in the UK. Nowhere else in the world does a single sport dominate during such an important time in the calendar, when, despite obvious distractions—religious, family and otherwise—that two-week period of English Premier League matches serves up four to five fixtures for each team in short succession, fueling the festive fervor even more. Can you be considered a “true” fan without going to games? Once you fall in love with “the one,” that’s it, right? I recently read an article stating that the number of Manchester United fans worldwide at last count was estimated to be more than 600 million. The vast majority of course will never get to grace Old Trafford at any time in their lives. These fans are every bit as relevant and committed to the cause; fans that live and breathe United, wherever their location. The last ever match that I saw at Old Trafford was a 2-0 victory against Bury in the third round of the 1992-93 FA Cup. Since that last personal homage, I have spent most of my life in the United States. Whatever my circumstance or geographical location, I have remained passionate in support of United. My wife still teases me as I grab my United scarf before going to bed, carefully wrapping it around the TV the night before each United match. As “Life, Liberty, and the Pursuit of United” will hopefully portray, no matter where life’s journey takes you, there is always a way to remain a true fan of your team. Manchester United became my team in 1975. We have been inseparable ever since. Do you feel that soccer has truly arrived in the U.S.? As I sat in the University of Michigan Stadium on August 2, 2014, as one of the 109,318 fans present to watch Manchester United take on Real Madrid, the only answer to that question is an unequivocal “YES!” The opportunity for the current soccer fan in America to be able to sit down on any given Saturday or Sunday and choose from any number of English Premier League, Spanish La Liga, Italian Serie A, or German Bundesliga live games on television tells its own story. The growth and expansion of the MLS, America’s soccer league, is most evident too. Couple that with midweek European Champions League and Europa League coverage along with a Sirius/XM satellite radio channel exclusively committed to 24/7 soccer debates and live coverage—then absolutely the answer has to be a most definite YES! Living in the States, I am able to watch more live English Premier League soccer matches each weekend than my friends and family back in the UK, from where the game is actually broadcast. Oh how far we have indeed come! Tell us a few weird and wacky facts about yourself. At the age of seventeen I attended a party dressed as Gandhi. An unusual ‘Zen-like’ impulse I guess. Still wearing my apparently sufficiently seductive Father of India attire I somehow managed to hook up with a girl at the end of the night. On conclusion of my after party tryst, the only mode of transport available at 3:00 am was her father’s bicycle with its one fixed pedal due to his chronic polio affliction. En route home there is a supposed haunted hall on the A59 between Preston and Southport. At the cusp of dawn I must have displayed a rather distinct ghost-like quality as I emerged from the woods onto the dual carriageway at break neck speed. Bald skull cap still in place, wooden walking cane across the bicycle handle bars (goodness knows why) and wearing nothing but a white sheet trailing magnificently behind me in the early morning breeze, any car passing by at that time must have felt the presence from Bank Hall for sure. My father woke me later that morning with the words “good night was it, eh son?” rather confused at seeing a one-pedaled bicycle laying in our driveway and his son laying in bed with a bald head and raging bloodshot eyes. “Yep, certainly was Dad,” my tired reply. Two summer seasons in succession I was commentator on the Kentucky Derby fairground race in Southport, England. On one occasion Dave Stewart of the Eurythmics sat down at our stall. After over an hour of his enthusiastic participation in race after race, and failing to win any, I took it upon myself to aid and abet his path to victory. For a good portion of the time, an aloof Annie Lennox, with her unmistakable orange hair, stood several yards away leaning against the fence of the Waltzers. I smiled to myself as, despite her distant posture, she wasn’t exactly incognito. The English musician and record producer did eventually hold aloft an apparently much sought after Southport Pleasureland Kentucky Derby Winner’s mug. He appeared so delighted that you would have been mistaken for thinking he had just won a Grammy. Before leaving our stall, he demonstrated an honest humility, down to earth and engaging, as we chatted for quite some time. Later that same night I stood just a few rows away from the stage at the Southport Theatre in awe of a guitarist from England’s northeast and a female singer from Scotland singing of ‘sweet dreams.’ A surreal day in the life for sure! I have broadcast a live radio show from the studio inside the Rock and Roll Hall of Fame, Cleveland, Ohio. I have climbed the Three Peaks in England’s Yorkshire Dales national park in the middle of winter. It is one the hardest things I have ever done. The significance of this feat is accentuated by the fact that I was not best prepared clothing-wise. As temperatures plummeted atop “Whernside,” I ended up having to borrow a spare scarf from my college roommate. I am saddened to declare that if you look closely at the all-conquering photograph of the four of us, looking ashen and knackered, I actually have a Leeds United scarf wrapped around my neck. My roommate from Yorkshire, and ardent Leeds United fanatic, has never let this Manchester United fan live that one down. I backpacked around the world in late 1988. No email. No cell phone. Traveling light, I didn’t even carry a coat. I did take my granddad’s First World War Union Jack flag which came in very handy for hitching rides through New Zealand. Six months later, I stepped back onto British shores. I was still wearing the one and only pair of sneakers that I had set off on in, my big toes stuck out pronouncing my return. I have held the Stanley Cup. It was heavy. I have held the soccer boots of Wayne Rooney, Nani, and Chicharito. They were not heavy. I was once interviewed for a job by Sir Alex Ferguson.